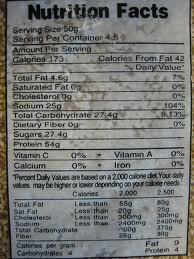 Certain information (by law) must be placed on food product labels. The nutritional information table provides average amounts of each macronutrient expected to be found in the product. However, in a BBC UK program in 2005, 70 products were tested for 570 nutrients, and only 7% actually matched the stated values. There is an acceptable 20% margin for error, yet 1/5 contained levels outside this mark. This means what ever these labels may say, they can sometimes be misleading. There are different governing bodies around the world that regulate food standards. The USA has the FDA (The Food and Drug Administration) and the UK has the FSA. (The Food Standard Agency) Performing a simple search ‘food standards’ on a search engine will bring up your governing body for food in your country. Food manufacturers can use many different term in their pursuit of selling their products to the public. This has almost certainly been brought about by the fierce competition in the food sales market. The FSA and FDA have provided many guidelines and legal requirements in the use of these terms so that they are not misleading to the public. However, once again research has found certain manufacturers misusing terms to generate more sales. Here are some terms of food regulations, by using your governing body for food website (FSA/FDA etc) you can check exactly what they mean. Over the past few years, people have become more health conscious, and as a result of this manufacturers have targeted this market. Yet again, if you as a consumer don’t understand the legal requirements you can be misled! ‘low calorie’ – this only means that the product must have lower calories than the original, but yet there is no set level. Please note the information above is based on the UK FSA. Laws in your country may vary, but still may be very similar. So I would highly recommend checking out your countries governing body for food standards! So you can see how some food manufacturers can mislead consumers into buying the product. When it comes to buying food, always check the labels. After stating everything above there are many companies that follow the rules perfectly, but I would say check your food agency for your country out, and see whether manufacturer’s stand. At the end of the day, companies are business’, which means they are there to make money, so if something appears to be good to be true, it probably is!